Gina Haspel To Tell Senate As CIA Director She Wouldn't Bring Back Waterboarding : The Two-Way Gina Haspel's prepared remarks say that "under my leadership CIA will not restart such a detention and interrogation program." She was at a CIA prison where prisoners were waterboarded. CIA Director nominee Gina Haspel walks to meetings on Capitol Hill on Monday. Anticipating tough questions about her role in the controversial post-Sept. 11 interrogation program, Gina Haspel plans to testify at her Senate confirmation hearing for CIA director that she won't re-establish those practices. 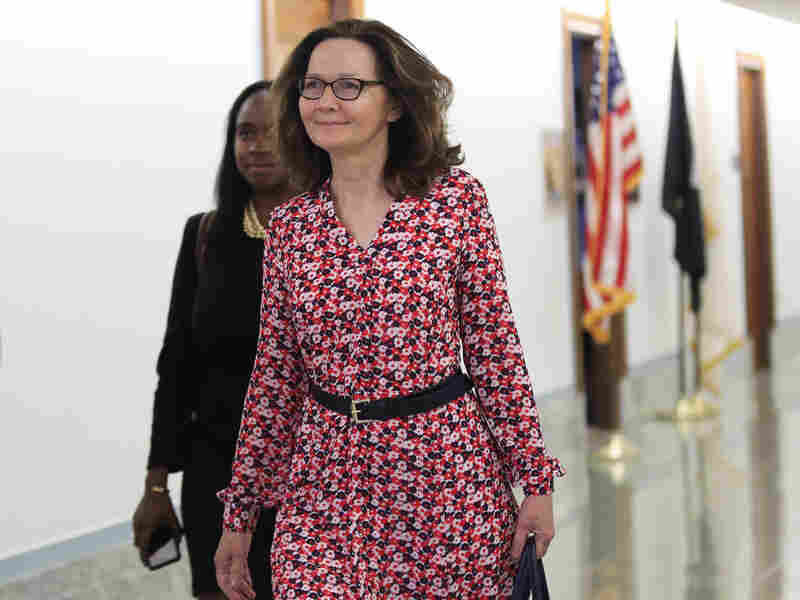 Reports that Haspel was assigned to a prison where the CIA had waterboarded prisoners have overshadowed her resume and endangered her confirmation. Her comments to the Senate Intelligence Committee Wednesday will be her first since President Trump nominated her. The CIA has not discussed her role at the prison. In excerpts from her prepared testimony, she says she knows people want to hear her address the agency's former interrogation program during what she calls "that tumultuous time." She says, "I can offer you my personal commitment, clearly and without reservation that under my leadership CIA will not restart such a detention and interrogation program." As NPR's Greg Myre reports, "She was at a black site prison in Thailand where al-Qaida suspects were waterboarded in 2002. And in 2005, she wrote a cable calling for the destruction of videotapes that showed that waterboarding." Waterboarding already has been outlawed by Congress, Greg reports, along with "other things that would be considered torture, whether it's sleep deprivation or putting people in extreme cold or slamming them up against walls, things that were done previously." After signing on in 1985, Haspel worked undercover for more than three decades for the CIA — including its Counterterrorism Center, where her first day on the job happened to be Sept. 11, 2001. She left undercover work last year, when she became the agency's deputy director. Haspel is the first woman to be nominated as CIA director and notes that there were few senior female leaders early in her career, and that "we are stronger now because that picture is changing." She says she has had an "outpouring of support from young women at CIA who consider [her nomination] a good sign for their own prospects."